The Historic Shepherdstown Museum will open for the season on April 6 with a display of historic Shepherdstown and Jefferson County silverware. Beginning on April 6, the Museum will be open on Saturdays from 11 a.m. to 5 p.m. and on Sundays from 1 to 4 p.m. It is located in the Entler Hotel building at 129 E. German Street in Shepherdstown. 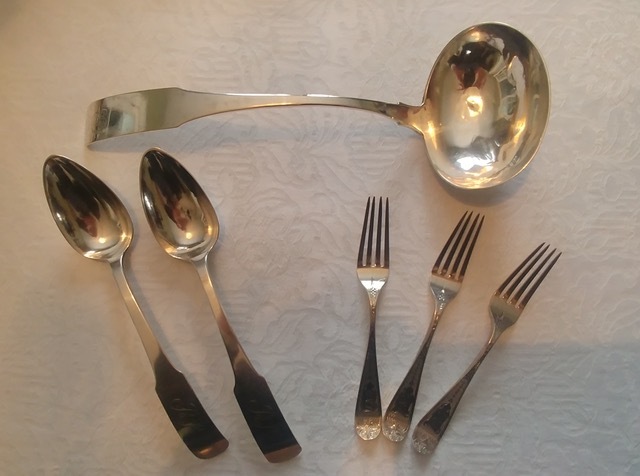 The silver display, which includes spoons and serving pieces made by a number of local craftsmen, is on loan from the extensive collection of Eric Hendricks Jenkins, a twelfth-generation resident of the Eastern Panhandle. He is an avid collector of local silver and other artifacts, a history teacher at Wildwood Middle School, and a docent at the Shepherdstown Museum. Mr. Jenkins tells some great stories about his pieces and the people who made them. 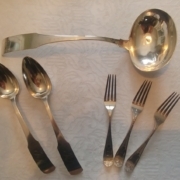 Among the items featured are spoons by Frederick Jerome Posey (1815-1881), who lived at the Entler Hotel and had his workshop there at one point. An opponent of slavery, Posey attempted to assist a group of slaves to escape from their owner to Canada in 1857. Posey lent his carriage to the group, which was led by an enslaved man named William Henry Mood and included a woman named Belinda Bivans. Bivans was attempting to find her father, who had escaped to Canada earlier. She said that her owner, though a Christian, was a “backslider,” and added that “money was his church.” Unfortunately, the group was caught in Chambersburg. Also on display will be silver items made by Jacob Craft and John Bernard Woltz, both also makers of tall clocks, several of which are on display in the Museum. Clockmaking clearly was only one source of their income. The Shepherdstown Museum houses a varied collection of other Shepherdstown objects, from prehistoric tools to an early Rural Free Delivery mail cart to two mid-twentieth century dial phones on which guests can call each other. A suggested donation of $4 for adults is welcome. Admission for children and members is free. For more information about the Museum opening or the exhibits, contact the Historic Shepherdstown Commission office at hsc1786@gmail.com or 304-876-0910.